In the hustle and bustle of the 21st century, everything is changing extremely fast, with new ideas being implemented on a daily basis. This is why, whether you’re an individual looking for an idea, or a society wanting to implement new activities, it’s important to know how to generate ideas in a fast and efficient way! So come along to U Social’s workshop delivered by recent graduate, GulAhmed Maqsood, who will share his innovation and idea generating techniques. The event will give you not only theoretical insights but also an opportunity to practice what you have learnt. Get fit with Sarah Marshall (former Enterprise Administrator!) this summer. Sarah left us last November to work full time on her own health and fitness business and hasn’t looked back since! She’s now back on campus with a quick lunchtime workout for all staff and students. A blend of cardio exercise to burn fat and body weight exercises to tone and sculpt those muscles. Meet at University House at 1pm (finish 1.45pm) – £5 per person. Like Sarah Marshall Fitness on Facebook, or call on 07733221883 for more information. You are invited to Lancaster Soup – (a donation of £5 is asked for). There will be four (short) presentations from local projects who would like some funding and you can ask some questions about their ideas. Over soup you can discuss and debate the ideas. Then we will vote. The project that gets the most votes gets the funds collected on the night. Easy, simple and direct. There will be some acoustic entertainment on the evening, some soup and good company. If you want to pitch for funds for a project dear to your heart that would benefit people in Lancaster and Morecambe, then please get in touch. We’ve decided the first themes (Food for 9th January and Music for 13th February, after that people who attend can help us decide what to fund next). Please let us know if you are coming, get in touch if you want to help or know more and SHARE with everyone and their pets, as the more people who come the more funds we can raise. More information can be found on the Facebook page. Have you signed up to Make it Happen yet? You’ve got to be in it to win it. 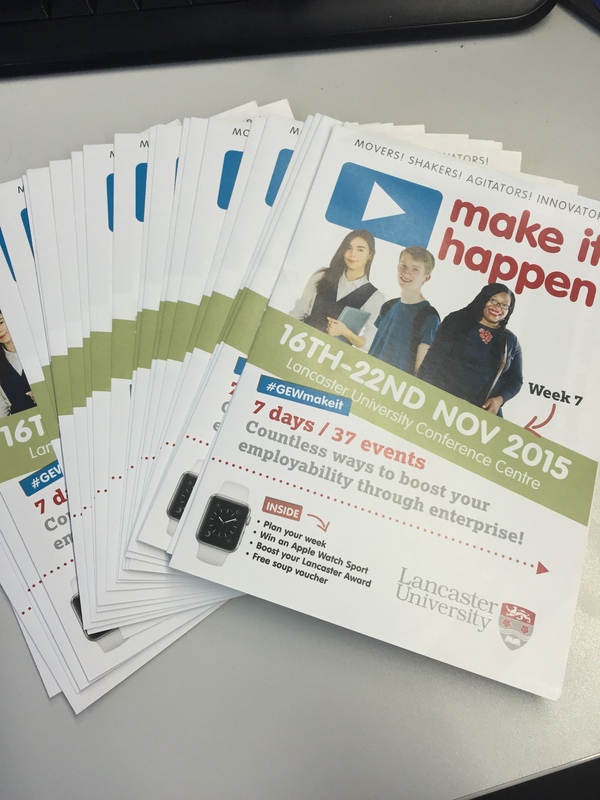 Have you registered for any make it happen events yet? So, we’ve distributed our brochures across campus and we’ve got posters on pillars, walls and office spaces. 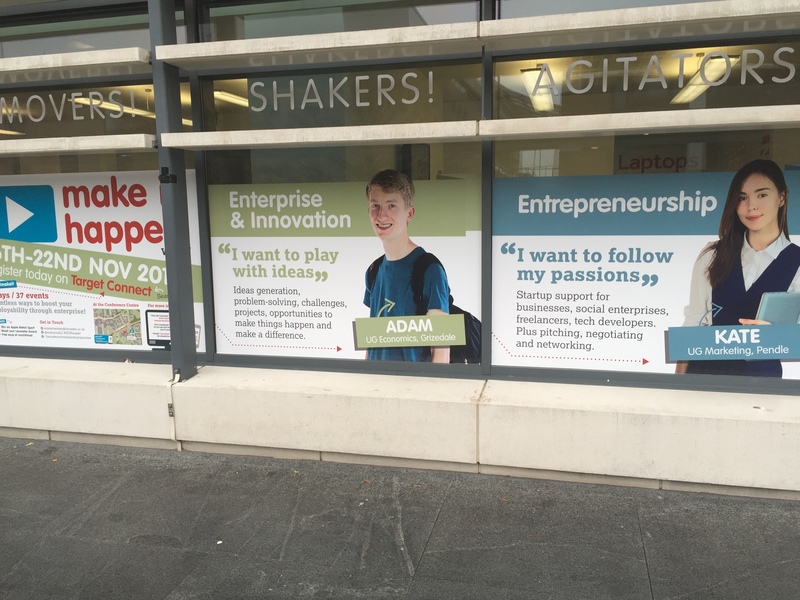 We’ve even managed to brighten up the Learning Zone windows with our three Make It Happen poster models. 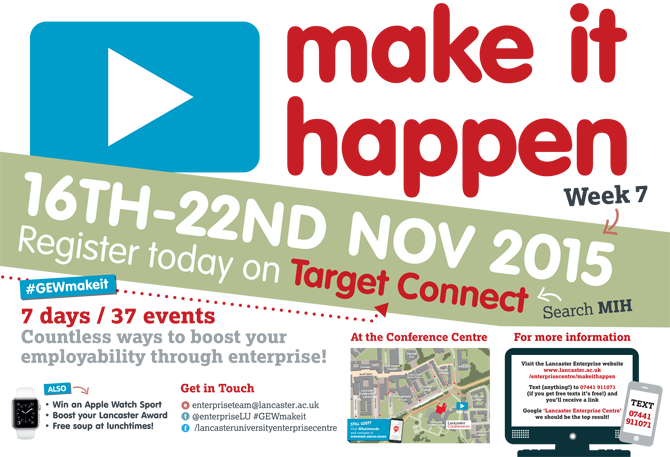 Find more information on all our sessions, events and pathways here. Tarun Sainani, a former Highwire PhD candidate, is in with a chance of winning a share of £500,000 for his app based business, World Around Me. Tarun (who incidentally is also featured on our homepage – see the picture under “I have experience I want to share with aspiring entrepreneurs”) created the app which allows users to find and easily identify services and amenities via their smartphone. Already partnered with Google, IBM and FbStart Accelerate, Tarun and his team will pitch to a final judging panel at MassChallenge UK before the winners are revealed at an awards ceremony later this month. Take a look at World Around Me for yourself, as well as the other 25 finalists here, and wish the team all the best in the final competition. Alex Tkatchev and Tim Seabrook have started their new business venture, Supp! Lancaster since graduating from Lancaster University. Supp! is for students who are dissatisfied with the current lack of community trading platforms and student retail providers. Our service is a sharing economy marketplace and online shop providing a new exchange framework for students. Unlike Gumtree, eBay or Amazon, we have assembled a community driven hub that allows you to freely and effectively share, sell and shop within your local community. As students, we searched high and low for good, cheap living essentials, and found nothing that met our needs. With few home products suitable for students on the market, we were required to find many of the items we now own from within the student community. We found this extremely time consuming, difficult to organize and very frustrating. We’ve built Supp! to make life easier for students by facilitating green trading, as well as providing a reliable and affordable source of quality living essentials. Students are currently facing financial turmoil. Accommodation and tuition fees continue to rise, giving birth to an ever-increasing demand for affordable, quality living essentials. At the same time, at Lancaster University alone, 3.9 tones of waste were left in 2010, increasing to 44 tones by 2014. The worst part – a large portion of the waste was categorized reusable; items students were merely unable to give away or sell like electronics, furniture and books. We want to connect the 35,000 individuals currently attempting to trade locally over ad-hoc Facebook Groups. Supp! aspires to become a financial safety net that connects students, giving local information and community support, as well as incentivizing generosity by rewarding users with perks. With the Exchange and Auction, users are given the ability and opportunity to share or sell their unwanted items locally at no cost. We have been gearing up to launch our online shop selling kitchen packs for the opening of Freshers Fair. We will be opening a round of Beta testing in the coming weeks for the marketplaces, with the Exchange & Auction opening up shortly after! At the fair we will be giving away discounts and prizes, so make sure to come say ”Hi” and see what we’re up to! Check out our website for more info and follow us on Facebook, Twitter and our other social media platforms for more updates! Additionally, you may contact us on hello@supplancs.co.uk if you have any questions! Supp! Lancaster are currently offering a discount on their kitchen starter packs, with free delivery and a variety of colours to choose from. Find out more here. Guest speaker, Shuddhaanandaa Brahmachari, will be sharing his expertise in mindfulness and reflections on its importance in leadership and social justice. It will be an informal, ‘Powerpoint free’ session and all are welcome. Learn more about Shuddhaanandaa Brahmachari here. 10% discount for bookings of 2+ people. “Mindfulness enables us to identify and implement the changes necessary to experience greater success in our personal and professional lives and ensures greater awareness and control over our life experience. It enhances our health and wellbeing and enables us to make informed choices that lead to positive change and growth, in order to take us in the direction of our personal and professional ‘goals’. If you’re interested in learning more about Mindfulness and how you can apply it to your career and life, this small group meeting is the perfect opportunity. Email Jan here for more information, or visit her website here. Dr Jan Goss is a former Lancaster University PhD student and was supported by the Enterprise Team whilst starting her business.